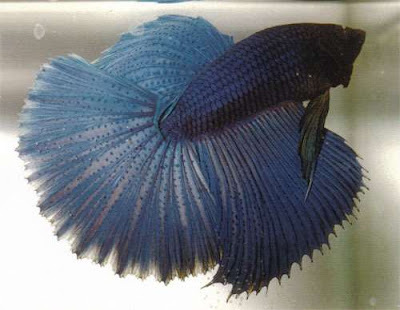 In 1982, American breeder Peter Goettner bred a fish that was well ahead of its time. This fish was a green STM with a caudal of almost 180 degrees, and was dubbed 'Mr. Great' by the admiring betta community. Goettner revealed that he acquired the stock that ultimately produced Mr. Great (or 'Mr. G' as he was later called) by another breeder, Parris Jones of the US, who had been improving on a line he had procurred from yet another American breeder, Chuck Hale, in 1977. Between 1983 and 1986 a group of French breeders began importing stock from several top American breeders, including Goettner and Jones, one of which was Guy Delaval. In 1988 Delaval then exhibited his fish at a show in LeMann, France. Although his fish were again overlooked in the judging, at least one fellow breeder was thunderstruck by what Delaval had been able to accomplish: Rajiv Masillamoni. 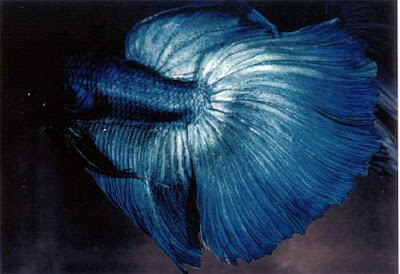 Masillamoni had a habit of carrying with him at all times a photograph of Mr. G, which he showed to everyone at every betta event he was able to attend, enthusing about the perfection of the form and asking where he might acquire a fish of it's caliber. Needless to say, when he first laid eyes on Delaval's entries, which were even better in spread and symmetry than what he had dared to dream, the photo of Mr. G slipped forgotten from his fingertips. He immediately began drilling Delaval about his fish, and was able to purchase two of the three 180 degree caudal males that Delaval had brought with him to the show, as well as five other males and two females from the same line. Masillamoni spirited his treasures back home to Switzerland, where he began breeding them with a passion. To his shock and horror he came to realize that every one of the seven males he had purchased from Delaval were unable to spawn properly. Although they would build a nest and court the female, they didn't seem able to perform the embrace and sire offspring. This didn't seem to be a fault of the form so much as a result of too much inbreeding, confirmed when Masillamoni consulted two other breeders who had acquired stock from Delaval -- Laurent Chenot and Marc Maurin -- who reported similar failures. Reduced to relying on the females alone, Masillamoni crossed them against pet store bettas, producing fish which were nowhere close to the quality of the original Delaval stock in either form or symmetry. When a stroke of bad luck killed one of the females, it seemed the entire venture would be doomed. However, Fortune was with Masillamoni and his project, and he was soon introduced to an American IBC member who happened to be visiting Switzerland and was able to give him a melano doubletail male from the Parris Jones line. Masillamoni bred the male to his one remaining Delaval female, and was rewarded with one fish that stood out from the rest. The fish was given the number 'R39', and was a green male with a perfect 180 degree caudal fin. with him in his quest to find another betta to equal him. As one after another of the Best of Show contestants were eliminated, Masillamoni was biting his fingernails. The green Halfmoon was still in the running. The judges continued to pare away the competition, until the decision was left between the Halfmoon entry and a royal blue male bred by Peter Goettner which showed a 160 degree caudal spread. It was clearly evident that the judges preferred the Goettner fish, but the outcome remained in contention. As a last resort, they called in a highly experienced Judge -- Mr. Jim Williams -- and asked his opinion. Since this was the same judge that placed the Goettner fish first in the Blue class, Masillamoni felt the matter was already decided. However, Williams examined both fish carefully under a bright flashlight for ten minutes, then switched to a magnifying class. 'There it is!' he finally announced to the waiting crowd. 'The blue is missing a scale.' IBC Convention Best of Show Male was awarded to the Green Halfmoon from Switzerland. Many thanks to our new friend in Switzerland, Rajiv Masillamoni, for his help in writing this article. Both Rajiv and Markus Gutzeit were willing to donate their time and photos to me when asked, including making phone calls all the way from Switzerland and scanning several pages of letters, notes, and photos. I found Rajiv is not only an extremely generous person, but an engaging conversationalist. Although I originally asked Rajiv for some insight and clarification into the history of the HM form, I was rewarded with a compelling and intensely rewarding story which had all the great elements: passion, intrigue, obstacles, and one HELL of a plot twist. Because the whole story could not possibly be included the project I am working on, I wanted to publish it here. I hope you enjoyed it as much as I did.